A couple of years ago, I went to Belize with my parents, brother, and sister in-law. We spend a day in Guatemala too. It was a fun trip with great company. We went in February. February is a great month to go somewhere warm. By the time February rolls around, it is still cold but I'm more than tired of winter. I little respite to a warmer climate is a welcome change. When I returned I made Belizean stew chicken and rice and beans. We ate this meal at least once a day the entire time we were in Belize. Last week I decided to make the stew chicken again. I changed it up by making it in the slow cooker. I also used boneless chicken breast instead of a whole chicken. I used the same stew chicken recipe as last time. 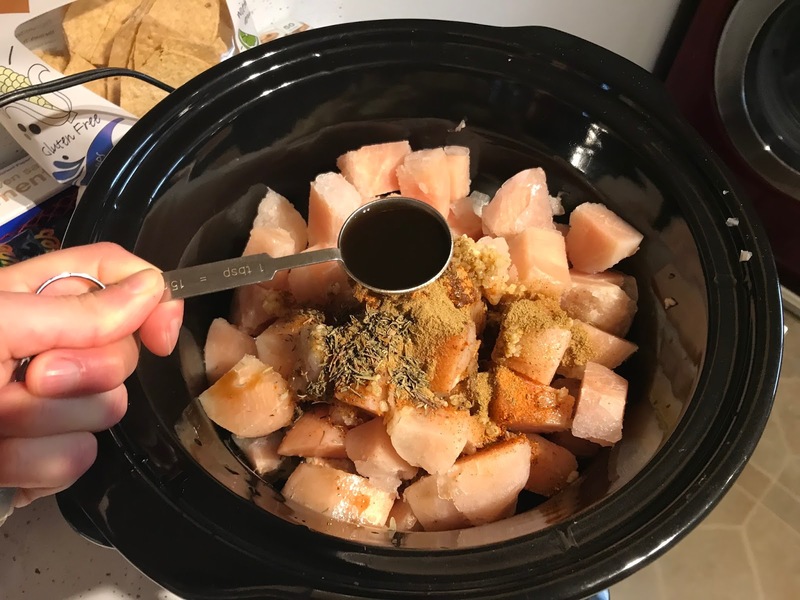 I used 2.5 pounds of boneless chicken breasts instead of a whole chicken. I used 3 tablespoons of red recado instead of 2. This is a special Belizean spice I could not find in regular grocery stores. You have to buy it online. I didn't use any oil or sugar either. I added from chicken broth to replace some of the water. I thickened the sauce with corn starch. 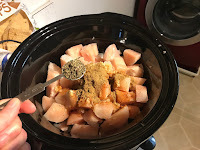 The ingredients are 2 1/2 pounds boneless chicken breasts, 1 onion, 1 green pepper, 3 tablespoons red recado, 5 garlic cloves, 3 tablespoons soy sauce, 3 tablespoons Worcestershire sauce, 3 tablespoons cumin, 1 teaspoon thyme, 1 teaspoon oregano, 2 teaspoon salt, black pepper, 2 bay leaves, 3 cup chicken broth, 4 tablespoons corn starch. 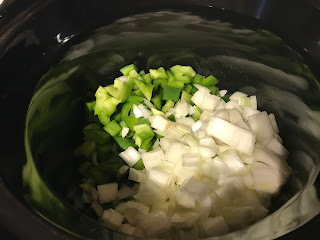 I chopped the onion and green pepper. I put them into the slow cooker. I also chopped the chicken and placed it into the slow cooker. I added the red recado and garlic. I added the cumin, soy sauce, worcestershire sauce, thyme, oregano, salt, pepper, and bay leaves. I added three cups of chicken broth and added enough water to cover the ingredients. I stirred the ingredients up, and let the chicken cook on low for about two and a half hours. I then mixed the cornstarch with some water and poured it into the stew. I let it cooke for another forty minutes on high. I served the chicken over rice and beans. I also added hot sauce on the chicken. This was a tasty meal, but I think I preferred the traditional method better. The chicken stayed more moist when you cook it on the bone. It was still a succulent, savory, and delicious meal though. It had a smokey flavor. The broth was flavorful. When we ate it in Belize the sauce was very watery. I added cornstarch so my broth was more of a sauce. I'm not sure that was a necessary addition. In the future, I will probably not add cornstarch. It was an enjoyable meal that I enjoyed all week. I would make it again.